One of the most interesting parts of reaching one's thirties is seeing how impermanent, flexible, and downright unexpected someone's career path can end up being. Such is the case with Motoi Okamoto. 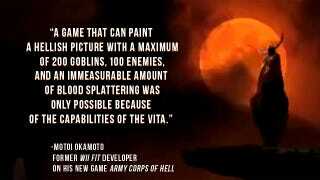 Previously having worked on a decade's worth of Nintendo titles, including Pikmin, Super Mario Sunshine, and Wii Play, Okamoto left Nintendo in 2008 to form Entersphere, the company responsible for PS Vita launch title Army Corps of Hell. There's quite a difference indeed between cute little plant-critters and a deposed king of Hell. Personally, I love seeing anyone make this kind of jump. So many writers, artists, and designers have so much creativity to put into the world that it's very cool to see them work with different platforms and genres.